So who's hating the international break more as the Premier League returns this weekend: Arsene Wenger or Harry Redknapp? Considering Harry Redknapp's politicking to get the England job after Euro 2012, I think Wenger edges that out right now. At least both sides have reasonable ties to navigate this weekend. Note all times are Eastern and TV is subject to change without notice. 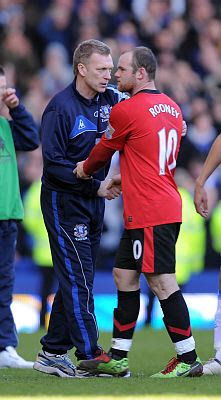 Saturday 7:45 am (Live on Fox Soccer Plus and FoxSoccer.tv): Everton v Manchester United. So Wayne Rooney, after having affairs revealed to the press and scoring for England midweek, gets to enjoy some home town abuse. That maybe the only highlight for Everton this weekend, as they have made way too many elementary mistakes in conceding goals this season. I don't expect that to stop this weekend. Prediction: Everton 1 Manchester United 2. Arsenal v Bolton Wanderers (Live on Fox Soccer Channel): With Sam Allardyce gone, Bolton has had little success against Arsenal. Even with Robin Van Persie and Theo Walcott missing, Bolton's attempt at beautiful football will backfire badly. While I expect goals, I think this will be rather one sided. Prediction: Arsenal 4 Bolton Wanderers 1. Fulham v Wolverhampton Wanderers: (Live FoxSoccer.tv. On delay 11:30 pm Fox Soccer Channel): With Fulham's injuries, and Wolves ability to scrap goals, this has 1-1 draw written all over it. Expect the game to bog down in the midfield, and chances to be few and far between. Prediction: Fulham 1 Wolverhampton Wanderers 1. Manchester City v Blackburn Rovers (Live on Fox Soccer Plus and FoxSoccer.tv): With Manchester City's new formation, they should have no problem picking Blackburn apart. The only thing that will stop them is the hard tackling that Blackburn are sure to start up. Then again, I thought that against Sunderland and was proven wrong. Blackburn kept up against Arsenal, and probably do the same here for an hour. Prediction: Manchester City 2 Blackburn Rovers 1. Newcastle United v Blackpool (Live FoxSoccer.tv. On delay Sunday 8:30 am Fox Soccer Plus): Blackpool have shown a great fighting spirit in the opening month of the season, while Newcastle United are starting to find their stride again. I have a bad feeling this game could be as ugly as Blackpool's trip to Arsenal. While I don't think it will end up as bad on the scoreline, expect Blackpool fans to keep on making plenty of noise. Prediction: Newcastle United 3 Blackpool 1. West Bromwich Albion v Tottenham Hotspur (Live FoxSoccer.tv. On delay 12:00 pm Fox Soccer Channel): No Dawson or Defoe for Tottenham, but Van der Vaart should make his debut and Peter Crouch is fit. This, however, will be an ugly game, as I expect West Brom to bunker and pray for a goal, while Tottenham will huff and puff and expect the best. When it's all said and done, I think Van der Vaart will be the difference in his first game. Prediction: West Bromwich Albion 0 Tottenham Hotspur 1. West Ham United v Chelsea (Live on ESPN2 and ESPN3.com): I'm going to spare you the time with the old 'West Ham has a chance' lines. They have none. However, Chelsea will make this hard on themselves. Prediction: West Ham United 0 Chelsea 2. Wigan Athletic v Sunderland (Live FoxSoccer.tv. On delay Sunday 12:30 pm Fox Soccer Plus): Wigan have given up 10 goals at home so far this season, while Sunderland have yet to score away from home. If this match was played last week, I'd give Wigan a chance. However, with a week to revert to their old ways again, I think Sunderland will enjoy a fun away day in front of the faithful few at the DW. Prediction: Wigan Athletic 1 Sunderland 3. Sunday 11:00 am (Live on Fox Soccer Channel): Birmingham City v Liverpool. Both games last season ended in draws. It could be argued that the referee robbed Birmingham City of a win at home last year as well. If this was at Anfield, I'd give Liverpool a chance at winning. However, I think Birmingham City will scrape out another draw. Prediction: Birmingham City 1 Liverpool 1. Monday 3:00 pm (Live on ESPN3.com): Stoke City v Aston Villa. With Gerald Houllier taking the reins at Villa, I'm curious to see what changes he makes. Stoke City have tried to tinker too much with what made them successful in the last two Premier League seasons. I don't expect them to catch onto that just yet. I think the new manager bounce will be in full effect here. Prediction: Stoke City 0 Aston Villa 1. What are your thoughts on this upcoming weekend in the Premier League? Let us know in the comments below. 3 of Starling scorelines exact matches. 3 though disagreed. I see Bolton giving Arsenal a better game but losing 2-1. Arshavin pace off the ball to support Chamakh, key. Arsenal 8 straight wins overall vs Bolton including 4-2 (after 0-2 comeback last season), The Houllier bounce I agree will be enough to get 3 points, and Tony Pulis will feel the fans wrath after. Wigan-Sunderland is a wild card with Sunderland road struggles and Wigan 0-10 on season goal differential.